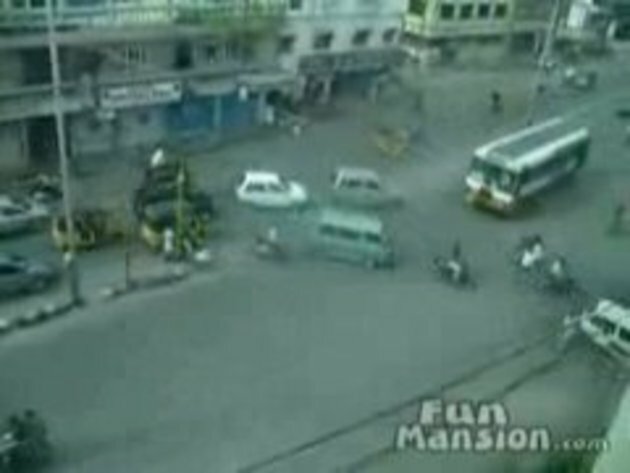 This is your average intersection in cities in India. Have you tried Thailand ? This explains a great deal about the quality of driving in inner cities in Britain. Holy Zen! They should show this video to people here in Miami. Apparently they still have not heard of traffic lights. did you saw any lexus around down there? what are those yellow and black vehicles? #6 traffic lights? Oh u mean the 3 colours decoration lights at the intersections. We have them in Vietnam but the problem is they are just for decorating purpose. Love driving in India... It's like the bumper cars at the fair! Brownian motion at its finest. Man, I've lived here in Asia WAY the hell too long when I look at that and go, "Yeah, so? Around here we call that Sunday morning." electric vehicles would become much cheaper travel where rivers dams. I rode in one in Sri Lanka a few years ago. An unforgettable experience.... never to be repeated.